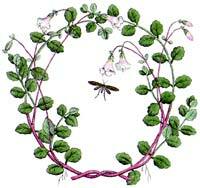 The twinflower grows on soft moss in dark spruce forests. It has small, pink, bell-shaped flowers with a delicate scent of vanilla. It is one of the most loved plants in Sweden and a popular decoration on porcelain, tablecloths and paintings. But how did the twinflower get its Latin name Linnaea? Did Linnaeus discover it? No, the plant was known since the 16th century. It was then thought that it was a kind of bellflower and it was called Campanula serpyllifolia. The twinflower was Linnaeus’ favourite plant and he really wanted it to be named Linnaea, but botanists never named plants after themselves so he needed help by someone who could name it after him. The solution to the problem turned up when Linnaeus lived in the Netherlands to take his PhD. There he made friends with the famous doctor and botanist Gronovius. He helped Linnaeus economically and in many other ways. He also gave the name Linnaea to the frail little plant. Linnaeus was very satisfied and he himself added the species name borealis, which means ”from northern areas”.